5+ Vegan Pesto Sauce Brands (Dairy-Free) to Buy - Is Pesto Vegan? Home » Food & Drink Guides » 5+ Vegan Pesto Sauce Brands (Dairy-Free) to Buy – Is Pesto Vegan? Is pesto vegan? Are there dairy-free and vegan pesto brands that you can serve up with your pasta or use as a dipping sauce? We've got the answers here! Delicious vegan pesto brands you can find online and in the store. Whether or not pesto is typically vegan. How to quickly and easily make your own vegan pesto. Common questions about pesto's vegan status (and their answers). Looking to save time and money at the store? Check out our plant-based (vegan) diet food list here or keep reading to learn about pesto! 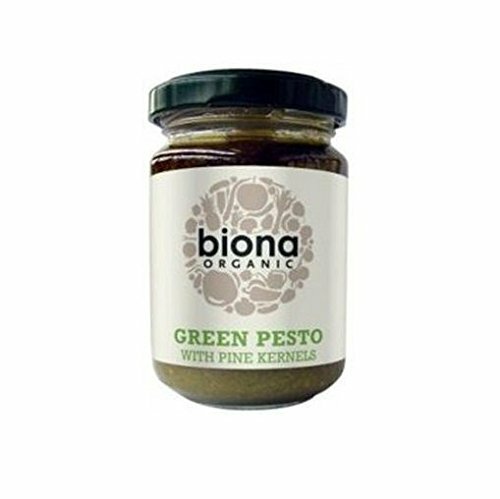 The first brand is Biona Organic, and they offer a Green Pesto with Pine Kernels. This pesto is similar in taste to traditionally-made pesto, but is made with an all-organic simple ingredient list: Fresh basil, extra virgin olive oil, and pine nuts. 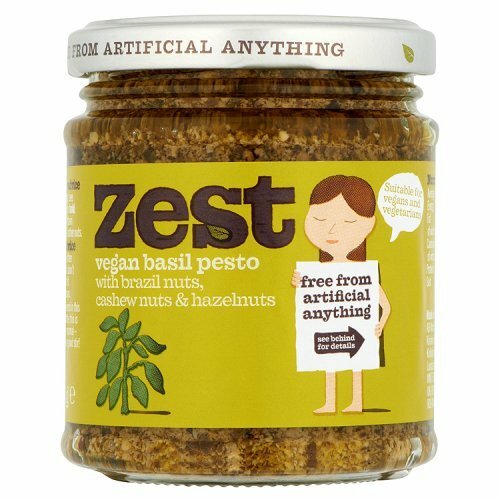 Zest has a pesto made with brazil nuts, cashew nuts, and hazelnuts, which actually states that its suitable for vegans and vegetarians on the jar. It’s perfect if you’re looking for something without pine nuts. 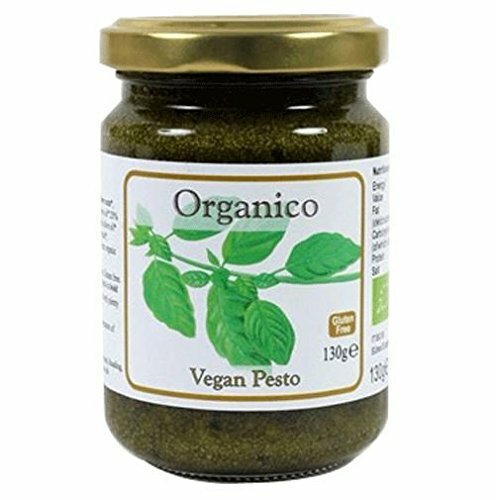 Their Vegan Basil Pesto is a classic tasting pesto, perfect if you’ve been missing the traditional parmesan version. Zest is a UK brand, but you can find them online in the US as well. Organico is, like its name suggests, an organic brand that’s made with all-vegan ingredients. Their Vegan Pesto replaces parmesan cheese with tofu and uses cashew nuts and walnuts instead of pine nuts. Because of this, it’s a bit different than a standard recipe – great for if you like to try new things. This classic Italian-style Green Pesto is made without dairy and nuts to make it accessible to everyone – even if you’ve got allergies. If, for you, pesto without nuts isn’t pesto, then this is unlikely to be the best choice. But if you’re into a lighter sauce, this is a great pick. 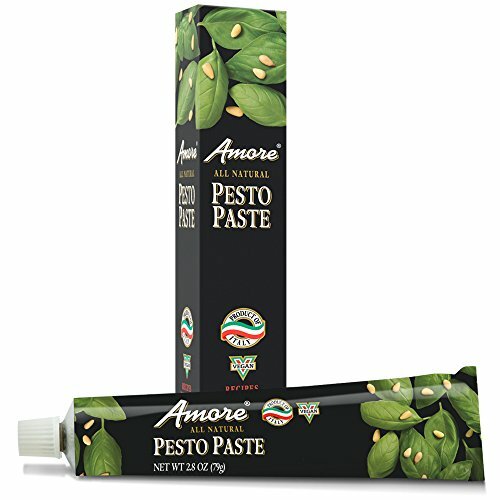 Amore offers a very classic-style pesto in terms of taste, but unusual in terms of presentation; while their Pesto Paste is made with all the same ingredients as a regular pesto (minus any animal products), it’s a smoother consistency, and comes packaged in a tube. With this in mind, it’s flavor profile tends to be a little more concentrated than other pesto brands so be sure to use sparingly! 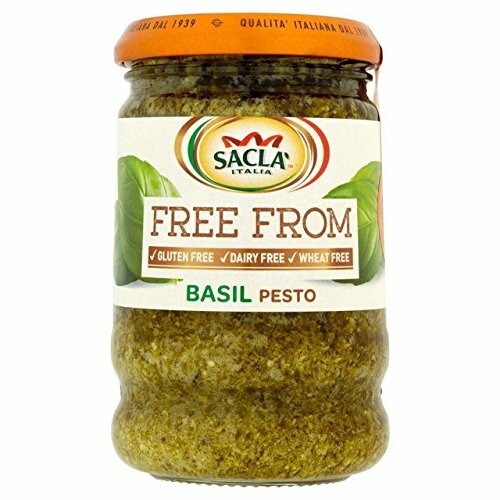 Sacla is one of the most popular dairy free pestos on the market. Their Free From Basil Pesto is gluten free, dairy free, and wheat free, which makes it great for vegans, vegetarians, and even those with Celiac. Like the Organico product, this pesto replaces parmesan with tofu. It also adds both cashews and, unusually, potato flakes. Great over pasta or as a salad dressing! Unfortunately, most pesto brands have parmesan cheese in them - even if only a small amount. This means that they are not vegan. Still, like all foods, there are many vegan basil pesto alternatives made nutritional yeast or options that simply leave out the parmesan cheese in favor of extra olive oil or pine nuts. Unfortunately, standard red pesto ingredients are typically not vegan. Recipes usually call for the same things as regular pesto, but with sun-dried tomatoes instead of fresh basil. They also tend to omit the lemon juice given the fact that the tomatoes are already acidic. Can I Make Vegan Pesto With No Oil? When there's a will there's a way! By adding something like white beans to your pesto you can add a creamy element that's a great substitute for olive oil! Are There Any Recipes With No Nuts? You can check out this nut free and dairy free pesto recipe for a basic idea on how to do it. White canned beans in a white ceramic dish. Is Pesto Suitable for Vegetarians? Since vegetarians tend to consume dairy products, yes, most pesto should be vegetarian friendly. Can I Use Cashews Instead of Pine Nuts? There's absolutely nothing wrong with using cashews instead of pine nuts when making vegan pesto. The flavor is obviously going to be slightly different, but still delicious! We often do our pesto with cashews because pine nuts can be super expensive. It's much more cost efficient to just use them as a special garnish rather than throwing them in the food processor. Can I Make Vegan Pesto Without Nutritional Yeast? You can, but it without nutritional yeast or cheese, your pesto is likely to be lacking in that super savory umami flavor. Using a little bit of miso paste instead of nutritional yeast can bring back some of those flavor profiles, but just don’t use too much! Overusing miso paste in a dish like pesto will quickly make it taste like Asian cuisine which is not what you want! Miso paste can be a great way to add cheesiness without nutritional yeast. How Can I Add More Nutrients to My Pesto? Since pesto is green and super flavorful you can get away with adding things like kale and peas without changing the flavor profile too much. We recommend making the standalone pesto and slowly adding a green vegetable to taste. You'd be surprised how much you can sneak in there without noticing. Peas can be a great way to add nutrients to your pesto. Serve over a whole wheat p​asta and enjoy all the nutrients! There are so many ways to enjoy pesto sauce as a vegan. To be honest, most of them are better than the "real" thing. By exploring some of the tips, recipes, and products in this post, you're sure to master making plant based pesto in no time! 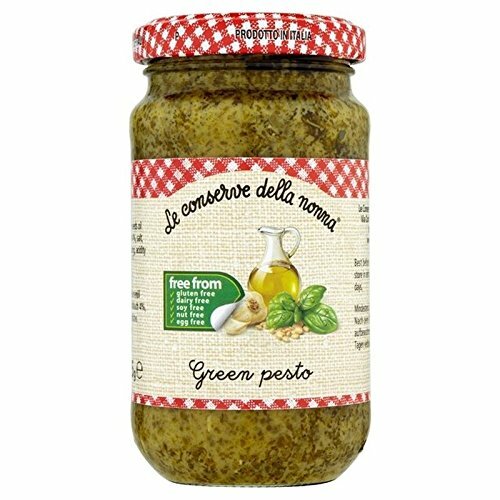 Another amazing company that has vegan pesto (but isn’t labeled/marketed as such) is a.g. Ferrari. Best vegan pesto I’ve ever had, hands down. I definitely recommend adding it to the list!